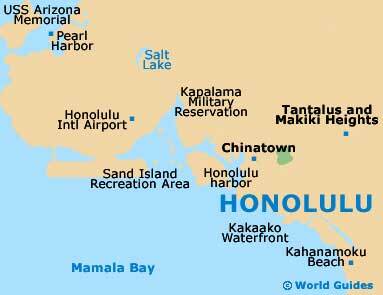 Located in the southeast of gorgeous Oahu, Honolulu is the capital of the Hawaiian Islands. 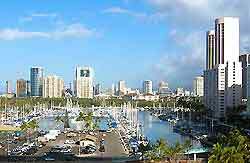 Honolulu boasts wide, renowned surfing beaches, much history and plenty of interesting areas, neighborhoods and districts, the most renowned of which is Waikiki, the epitome of Honolulu. Waikiki is loaded with quality restaurants, hotels and tourists, while the downtown Honolulu district is real a tourist hotspot, set back from the sea, encompassing the irresistible and bustling Chinatown and numerous noteworthy buildings, both new and old. Located in downtown Honolulu, Honolulu's 15-block historic Chinatown is perhaps one of the best Chinatowns in the USA, with its huge open air market, numerous art galleries and theaters, specialty restaurants and Chinese medicine shops. As well as boasting new apartment blocks and shopping malls, Chinatown remains authentic in retaining its original character through its inconspicuous alleyways and old, walled courtyards that are ideal for guided or self-guided tours. Downtown Honolulu is the center of Hawaii's capital city and is an exciting blend of old and new buildings, many of which have been declared National Historic Landmarks. The downtown Honolulu region is divided into four districts; Capitol District, centered on the Hawaii State Capitol and housing such landmarks as the Iolani Palace; the Central Business District (CBD), which contains most of the city's skyscrapers; historical Chinatown, with its myriad of restaurants and shops; and the waterfront district. 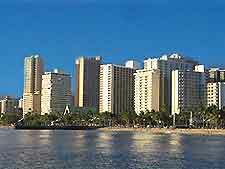 Waikiki is the main tourist area in Honolulu and it is easy to see why. The beach area is one of fine sands, crystal clear waters, great surf and a mountain of activities backed by a swathe of high-rise hotels and a multitude of other attractions including numerous cafés, restaurants, bars and nightclubs. To the southeast of Waikiki Beach is the dramatic Diamond Head crater and sandwiched in between is the excellent Kapiolani Park, where you will find the Honolulu Zoo, the aquarium and plenty of sporting activities such as football and tennis. 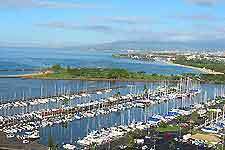 The waterfront area of Honolulu Harbor has been a hive of activity since the early days when passengers would dock here from all over the world. Today the harbor is still just as busy, with cruise ships coming in and out and people visiting the various attractions in and around Honolulu's waterfront district. 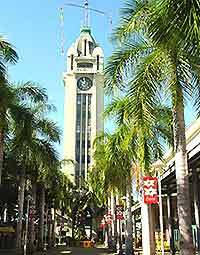 The Aloha Tower Marketplace, welcoming visitors to the island, overlooks the harbor and is the main landmark and shopping center on the waterfront, while the 'Falls of Clyde' square-rigged ship is also a noteworthy attraction. Honolulu's other districts are also worthy of some time and include Ala Moana, near Waikiki and downtown with its many shopping centers; the upmarket area of Kahala; Kaimuki, known for its restaurants and shops as well as its interesting architecture on Waialae Avenue; Makiki Heights, near the Punchbowl Crater for fantastic views; and Manoa.